A leading indicator of big trouble. This could not have come at a more perfect time, with the Fed once again flip-flopping about raising rates. After appearing to wipe rate hikes off the table earlier this year, the Fed put them back on the table, perhaps as soon as June, according to the Fed minutes. A coterie of Fed heads was paraded in front of the media today and yesterday to make sure everyone got that point, pending further flip-flopping. Drowned out by this hullabaloo, the Board of Governors of the Federal Reserve released its delinquency and charge-off data for all commercial banks in the first quarter – very sobering data. So here a few nuggets. Consumer loans and credit card loans have been hanging in there so far. Credit card delinquencies rose in the second half of 2015, but in Q1 2016, they ticked down a little. And mortgage delinquencies are low and falling. When home prices are soaring, no one defaults for long; you can sell the home and pay off your mortgage. Mortgage delinquencies rise after home prices have been falling for a while. They’re a lagging indicator. But on the business side, delinquencies are spiking! 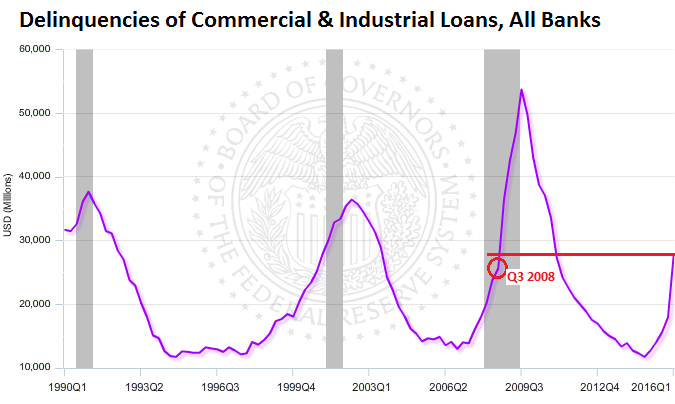 Delinquencies of commercial and industrial loans at all banks, after hitting a low point in Q4 2014 of $11.7 billion, have begun to balloon (they’re delinquent when they’re 30 days or more past due). Initially, this was due to the oil & gas fiasco, but increasingly it’s due to trouble in many other sectors, including retail. Between Q4 2014 and Q1 2016, delinquencies spiked 137% to $27.8 billion. They’re halfway toward to the all-time peak during the Financial Crisis in Q3 2009 of $53.7 billion. And they’re higher than they’d been in Q3 2008, just as Lehman Brothers had its moment. Business loan delinquencies are a leading indicator of big economic trouble. They begin to rise at the end of the credit cycle, on loans that were made in good times by over-eager loan officers with the encouragement of the Fed. But suddenly, the weight of this debt poses a major problem for borrowers whose sales, instead of soaring as projected during good times, may be shrinking, and whose expenses may be rising, and there’s no money left to service the loan. The loan officer, feeling the hot breath of regulators on his neck, and seeing the Fed fiddle with the rate button, refuses to “extend and pretend,” as the time-honored banking practice is called of kicking the can down the road in good times. If delinquencies are not cured within a specified time, they’re removed from the delinquency basket and dropped into the default basket. When defaults are not cured within a specified time, the bank deems a portion or all of the loan balance uncollectible and writes it off, therefore moving it out of the default basket into the write-off basket. 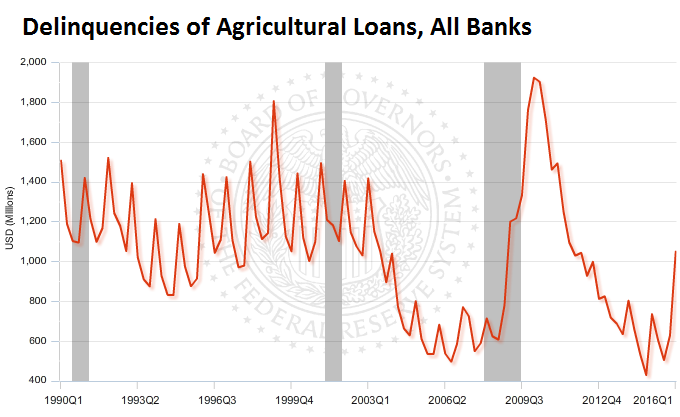 That’s why the delinquency basket doesn’t get very large – loans don’t stay in it very long. And farmers are having trouble. Slumping prices of agricultural commodities have done a job on farmers, many of whom are good-sized enterprises. Farmland is also owned by investors, including hedge funds, who’ve piled into it during the boom, powered by the meme that land prices would soar for all times because humans will always need food. Then they leased the land to growers. 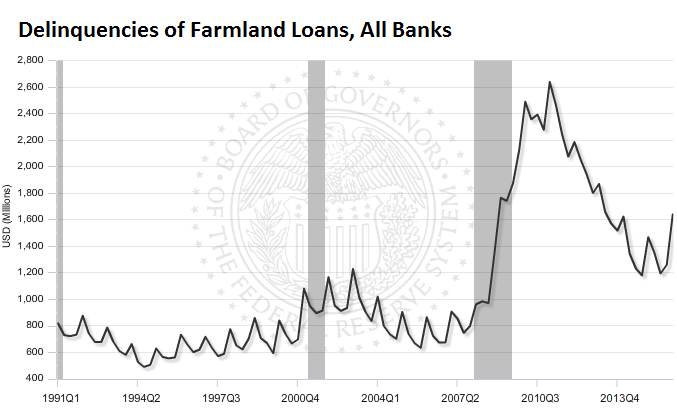 Now delinquencies of farmland loans and agricultural loans are sending serious warning signals. These delinquencies don’t hit the megabanks. They hit smaller specialized farm lenders. Bad loans are made in good times — the oldest banking rule. “Good times” may not be a good economy, but one when rates are low and commercial loan officers are desperate to bring in some interest income. With a wink and a nod, they extend loans to businesses that look good for the moment. That has been the case ever since the Fed repressed interest rates during the Financial Crisis. A lot of bad loans were made during those “good times,” precisely as the Fed had encouraged them to do. And these loans are now coming home to roost. One of the big indicators of the end of the “credit cycle” is the number of bankruptcies. During good times, so earlier in the credit cycle, companies borrow money. Lured by low interest rates and rosy-scenario rhetoric, they borrow even more. Then reality sets in.